Announcement At Southern Charm our passion is creating unique treasures from objects old and new. We are constantly finding inspiration for one-of-a-kind crafts. 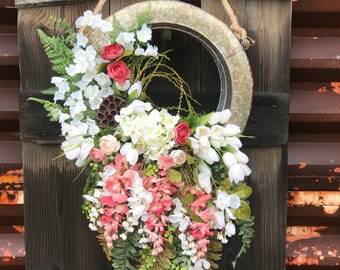 We offer grapevine wreaths, many of which are accented with hand painted signs for a personal touch. Our floral arrangements vary from luxurious to home-spun charm featuring recycled items. Vintage gas cans are transformed into lanterns adorned with designs for all seasons. Wood-cutting saws are reborn from function to fanciful creations. We offer custom-made, distressed wooden cake and dessert stands in a variety of styles and sizes , and to compliment the sensory experience, we have our own handmade candle and tart line. These are just a few of the cherished, hand-crafted items we make at Southern Charm. 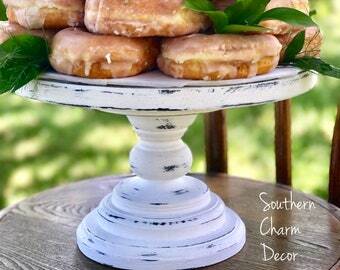 At Southern Charm our passion is creating unique treasures from objects old and new. We are constantly finding inspiration for one-of-a-kind crafts. We offer grapevine wreaths, many of which are accented with hand painted signs for a personal touch. Our floral arrangements vary from luxurious to home-spun charm featuring recycled items. Vintage gas cans are transformed into lanterns adorned with designs for all seasons. Wood-cutting saws are reborn from function to fanciful creations. 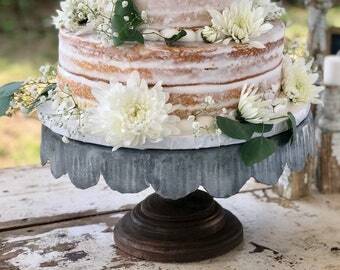 We offer custom-made, distressed wooden cake and dessert stands in a variety of styles and sizes , and to compliment the sensory experience, we have our own handmade candle and tart line. These are just a few of the cherished, hand-crafted items we make at Southern Charm. The first stand the seller shipped to me broke in the shipping process. The second stand the seller shipped to me (at no charge) also broke in the shipping process, in the same place. However, my husband was able to screw the two pieces together. Very pretty, but not the best design, as it breaks easily. Wood based arrived damaged; wasn’t wrapped and very little padding in the box. The top differs from the picture. Wasn’t offered a replacement, was just told I could return.